The name “Still Creek” may not quicken the pulse of southern B.C.’s white water paddlers; but the blackberry thorns that line the tributary’s urban bike trail are sure to draw blood from a Lower Mainland peddler or two. Not only is Still Creek one of Vancouver’s original city streams, but it actually flows away from the ocean and toward the Fraser River. 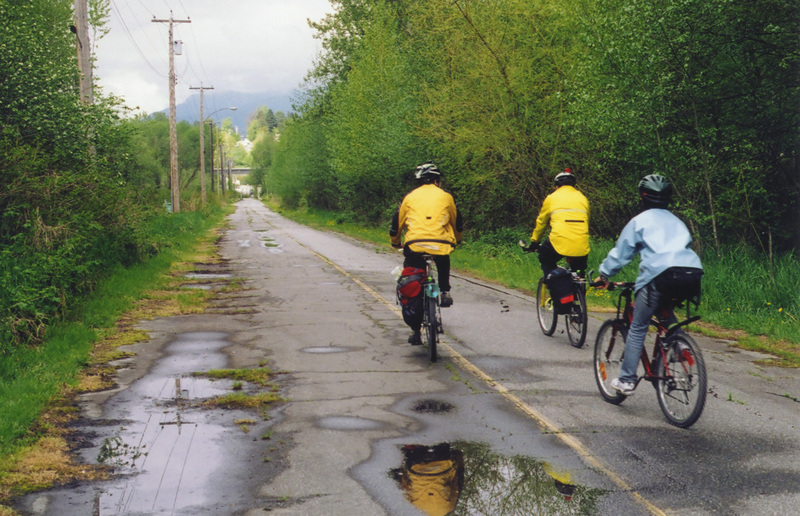 While municipal planners pore over a 50 year plan to rehabilitate the historic watershed; a Vancouver-based collection of cycling advocates have ~ with the support of VanCity, Translink, Transport Canada, and other private and public organizations ~ scratched up enough funding, support and publicity in six years to slam a multi-use trail down along its course. When it’s signed, sealed and landscaped in March of 2007, the 22-kilometre Central Valley Greenway will span Vancouver, Burnaby, and New Westminster and offer those cities’ residents an chance to travel to workplaces, shopping centres, schools, and transit stations without their cars; more Greenway, less Kingsway. Until then, adventurous local cyclists have discovered that ~ as Richard Campbell of Better Environmentally Sound Transportation (B.E.S.T.) puts it ~ there’s “a functional interim route” just begging for a good urban bushwhack. The route-in-progress follows Still Creek’s passage to Burnaby Lake and into the Brunette River, but has minimal signage, varied terrain and can be tough to navigate. It enters sections of private land where, says Campbell, until rights-of-way are finalized, “If you go through there, you are trespassing.” (To keep trail blazers on the straight and narrow, B.E.S.T. offers downloadable maps of the proposed and alternative routes on its Web site. For everyone else, B.E.S.T. will be leading a free orientation group ride this Saturday July 23). The serpentine, traffic-calmed two kilometre “showcase” section of the Greenway between Victoria Drive and Slocan Street is a great sampler for families, but urban adventurers may want to press on eastwards to where the trail gets a little wild and crazy. Past Slocan Street, Vancouver’s stands of public art transition to Burnaby’s galleries of spray-paint murals. Neatly planted native sedges and conifers give way to chaotic brambles of calf-snagging blackberries. The trail surface ranges from railway-bed gravel and drainage-ditch planks near Boundary Road to dirt-track sand at the Burnaby Recycling Depot and hard-packed gravel along the Brunette River east of Caribou Road. 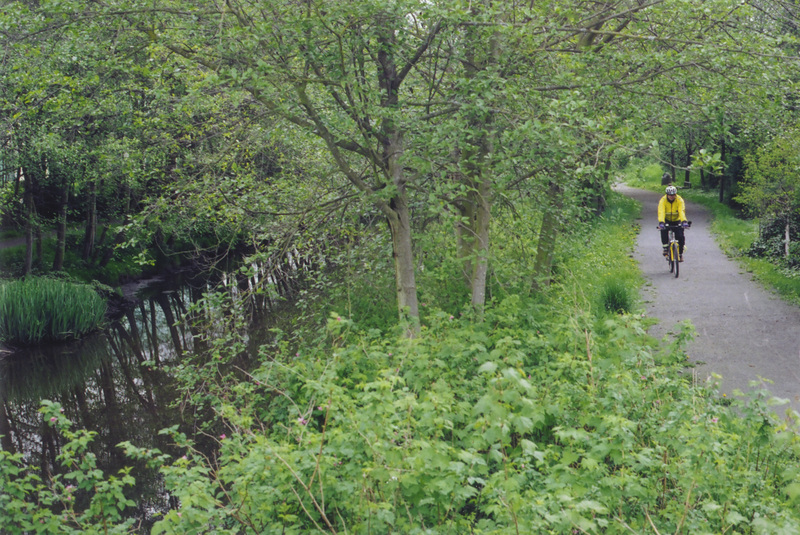 Along the way the Greenway provides covert access to Still Creek’s duck ponds, the Brunette River’s kayak course, and Sapperton Landing’s boardwalk park. It reveals unexpected storefronts like Pro Organics’ Saturday-morning market, Habitat for Humanity’s ReStore, and Jack’s All Around Demolition. And it allows a back-yard view of what a city looks like when it’s working: the bumping railway cars leaving the False Creek switches; the piles of stone, gravel, and soil waiting at the Burnaby work yard; and the tugboats and log booms struggling against the Fraser’s tidal push in New Westminster. At this point, the CVG’s “interim route” still has its raw sections: it’s challenging for kids (unless they’re in a child trailer or on a Trail-A-Bike) and wheelchair users (off-roaders exempted), and it dares you to step over active railway tracks, under barbed-wire fences, and through awkward intersections. But if you and your friends enjoy a bit of wayward orienteering when you go on a bike ride, pack a lunch, and have a blast. Explore the trail while it’s less developed (if you get lost remember the locals do speak your language and will accept your currency at par) and imagine a day not too far in the future when you can follow a river to work instead of a Range Rover. Bring your bike, your helmet, your lunch and your curiosity to B.E.S.T.’s annual tour of the Central Valley Greenway Saturday July 23. Meet at 9am at Trout Lake Park (east of 14th and Victoria, Vancouver) to register and pick up a MEC waterbottle, a button, and a CVG brochure. The leisurely round-trip guided ride is approximately 6 hours, including a break at Hume Park. Free admission. For more information about the July 23 ride in particular or the Central Valley in general, call B.E.S.T. at 604-669-2860 or visit http://www.best.bc.ca.